In this reprint of a 1988 novel, Commander Rallya of the patrol ship Bhattya takes on a new officer; an oath breaker named Rafe. Not only is Rallya gambling by taking on an oath breaker, Rafe has also undergone a memory wipe as punishment. All Rafe wants is to do his job and perhaps earn the grudging respect of his new crewmembers but the deep secrets hidden in Rafe’s memories begin to flutter to the surface, secrets which may plunge the kingdoms into war. 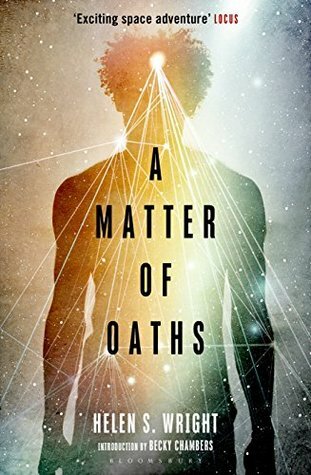 This is an awesome space opera with odd politics that can get bogged down in its own details at times – both in the technical aspects and in the political. However, when the action is front and center; this book is a sharp, intelligent science fiction offering that is a nearly perfect book. It is truly a hidden gem that explores LGBT and people of color in science fiction and even has a retirement age captain! I’m sorry I didn’t come across this sooner. 4.8 out of 5.